Indoor slippers with a garter fastening. Sizes EU 35 - 39. Genuine leather & soft suede leather sole. Light, easy to slip on. Fill in the required information in the "Order details" section below and press the Save button. By buying this product you can collect up to 1 loyalty point. Your cart will total 1 point that can be converted into a voucher of 1,00€. 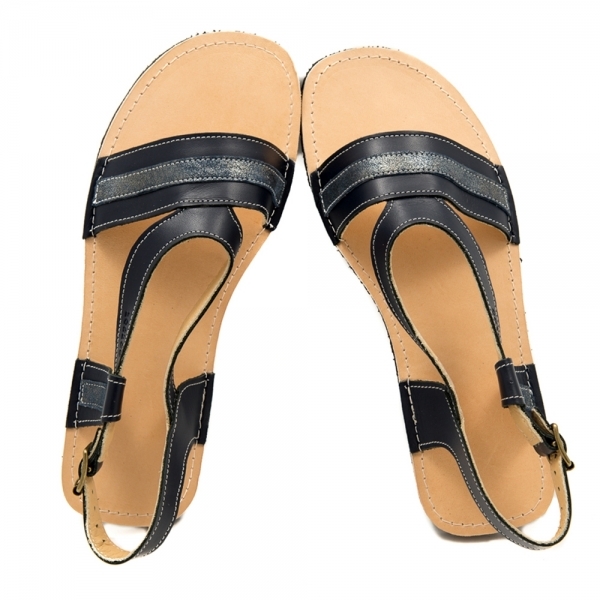 Outside and sole: 100% genuine leather, formaldehyde and azo dyes free. The soft sole and flexible construction of the slippers are engineered to render a barefoot feeling as close as possible, giving the best feeling of the terrain. The soft sole makes them suitable for walking indoors, since the suede surface prevents from slipping on home floors. The air circulation is very good because they do not have glue and a lining. HOW TO DETERMINE THE SIZE: Measure the feet as described here. The inner dimensions of this model are described in this table. There has to be 5-10 mm between the feet and the inner sides of the shoes. If the feet are significantly narrower or wider, please contact us first. We can make correction in the width, which currently we make by hand and we charge extra €5 for making the shoes narrow and €10 for wide shoes. You can add the extra charge here. Products with correction in the size are not subject to our standard return policy. Column "SHOE WIDTH (TOES)" is for your reference. Currently we do not correct the sole width. You can find more information about the sizes here. For more information on how care for the products, please visit this page. Length (from toe to heel) in cm. Circumference around the toes in cm.